Got $2,000 burning a hole in your pocket? If so, that's just how much an iPhone 6 case called The Slit is going to cost you and your exquisite taste for all things premium. Squair is a Japanese case manufacturer that creates high-end, fashionable cases for Apple's line of iPhones from a material called Extra Super Duralumin A7075. This is supposedly a special formulation of an aluminum alloy that is both super strong and lightweight. Not long after LifeProof revealed its water and shock-proof Fre case for the iPhone 6, the company's more advanced Nuud waterproof case featuring an impressive screenless technology that let's you touch the actual glass touchscreen of your device without an easy-to-scratch plastic screen protector to get in the way of that ultra-smooth finger gliding experience – is slated to be released early next month for $90. And now we also know what LifeProof's Nuud case for the iPhone 6 looks like. It'll be available in both black and white with a more revealing see-through clear back design similar to its predecessor. Magpul announced that its popular and highly textured Field Case cases are now available for the iPhone 6 and iPhone 6 Plus, with the more rugged dual-layered Bump Case dropping in as late as spring. Magpul kept the Field Case true to its original design with of course only its form factor slimmed down to fit Apple's slimmer, and much rounder smartphone. 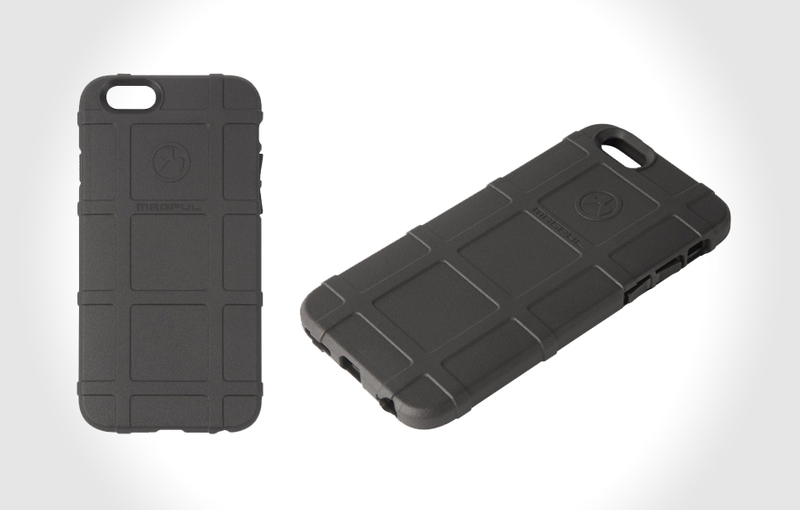 The new Magpul Field Case for the iPhone 6 is a semi-rigid cover designed to provide basic protection in the field. Using a new synthetic material, the Field Case features PMAG-style ribs for added grip, snap-on design for easy installation and removal, and slides easily in and out of pockets without snagging. Although the iPhone 6 Plus case is expected to start shipping in mid-December, customers can now order the Field Case for the iPhone 6 in black and olive drab green with more colors to come soon – for $17. In addition to newly released cases for the new iPhones, Magpul has also made a Bump Case (ships in mid-December) and Field Case (now available) cases for the Samsung Galaxy S5. LifeProof has finally released its Fre waterproof case for the iPhone 6 today sporting a familiar, albeit much slimmer design than previous Fre cases for the iPhone. LifeProof's Fre features a built-in (plastic) screen protection with Touch ID support, and it can be fully submerged underwater up to a depth of 2 meters for up to one hour. In addition, the Fre offers the iPhone 6 full protection against dust, dirt, snow as well as drops from up to 2 meters in height. It's available now in black only for $80. An iPhone 6 Plus version of the Fre has yet to be released, but LifeProof has confirmed that it is coming soon. This is Lunatik's new AQUATIK case. Arguably the best looking and sleekest waterproof case for the iPhone 6. It's the first waterproof case we've seen that actually doesn't look like one, but rather more like an ordinary stylish protective case thanks to its low-profile and slim design. Don't let the sleek design fool you though because the AQUATIK is built using some tough engineering that meets or exceeds IP68 technical specs and military 810G drop test standards. Billed as Lunatik's slimmest ultra-protective case, the AQUATIK features refined rounded edges, articulating vibrate/mute switch and optimized button tactility, and an easy snap-in two-piece installation design similar to that of a LifeProof case.